In my last Frank Blank Music entry, I wrote about a performance by Sons of Cream, a powerful tribute to a powerful power trio that includes Kofi Baker on drums, son of the legendary Ginger Baker. 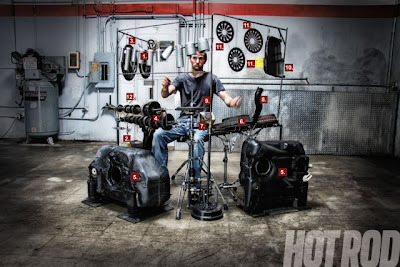 Sticking to the percussion realm, I also read in the latest Hot Rod Magazine about an interesting guy named Jordan Hill. Naturally most drummers like to bang on stuff, but Hill’s a drummer who’s around car parts a lot. So it was perhaps inevitable that he would develop a percussion kit out of - what else? Car parts. Jordan Hill, ready to rock. One of the interesting things about the kit is that Hill has assembled a truly musical instrument, with parts that are tuned to allow the creation of melodies and contrasting musical movements. So why did I mention Kofi Baker at the beginning of this piece? 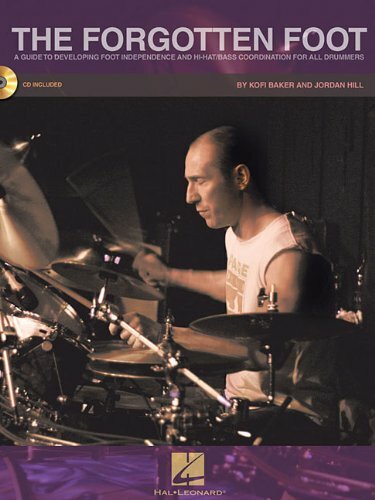 It turns out that Jordan Hill has co-written a book with Kofi about drumming, The Forgotten Foot. 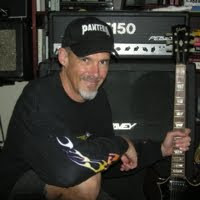 If Hill’s approach to kick drums and hi-hat is as inventive as his use of car parts as musical components, your feet will surely be breaking new ground on those pedals.